The mobile toy box app allows players to create their own worlds and share them with others. Disney Interactive announced the release of Disney Infinity: Toy Box 3.0, the mobile Toy Box application for the latest edition of the Disney Infinity video game series. This newest game features a variety of Star Wars, Marvel, Disney and Disney Pixar characters, but the app also includes “forward-compatibility” with the previous two games in the franchise, allowing players to bring all of their toys from previous installments to life in this new game. While existing Disney Infinity fans unlock their new characters using the codes included in the packaging for each real-world figure, all players have access to three weekly rotating characters from one or more universes in the game (like Star Wars or Marvel). If users would rather not purchase the real-world figures to unlock these characters permanently, they have the option to unlock specific characters via in-app purchase. 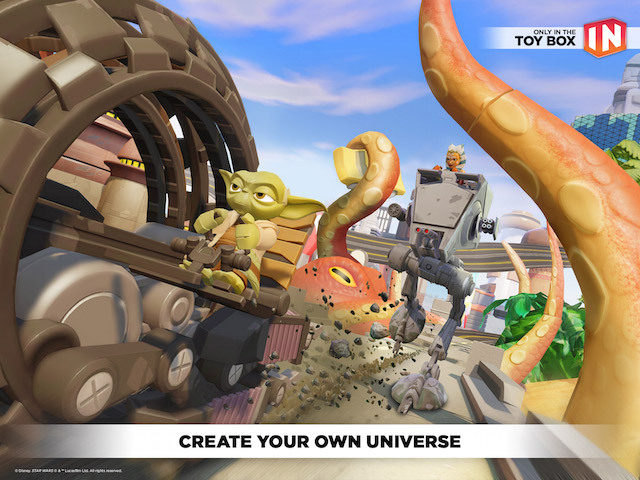 Disney Infinity: Toy Box 3.0 offers two control options (classic and swipe), and allows players to create worlds and environments using a wide assortment of buildings, cars and many other toy items. Gamers can carry their progress and Toy Boxes over from other versions of the game to continue where they left off, with local multiplayer functionality also available. Once they’re finished, gamers can share their worlds with others. In addition to building customized worlds, players can visit the Toy Box Hub, where portals lead to specific driving or combat events, as examples. Gamers can visit INteriors for entering and decorating buildings, can try their hand at a farming simulation and can travel to the El Capitan community center. Finally, the game offers access to stock adventures and the premium Toy Box Speedway expansion, which is available via in-app purchase. As players interact with the game, they’ll unlock new toys for their toy box, which can be used when creating or customizing content. Additional items can also be purchased in the game’s store. Individual characters will level up as players use them to explore or complete quests, and can be upgraded with skill points to make them more powerful. This launch is especially exciting for us because mobile has consistently been the most popular platform for Disney Infinity in terms of the number of players and the overall engagement of the community. In fact, mobile players upload and download more Disney Infinity Toy Boxes through mobile devices and tablets than on any other platform. Disney Infinity: Toy Box 3.0 is available to download for free on the iTunes App Store, Google Play and the Amazon Appstore.